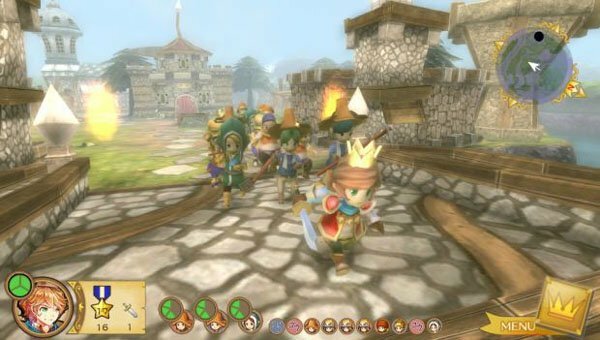 New Little King's Story is a good game, but a lack of depth and variety keep it from being fit for a king. 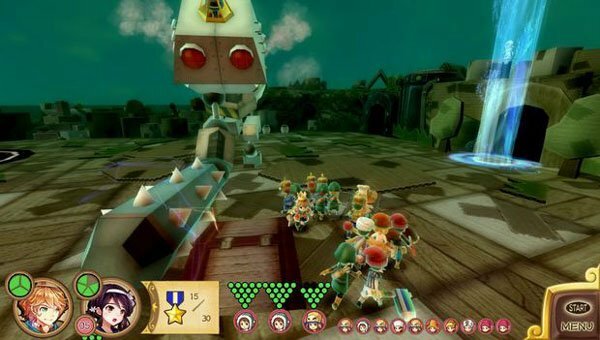 The original Little King’s Story was a surprise when it released on the Wii three years ago. 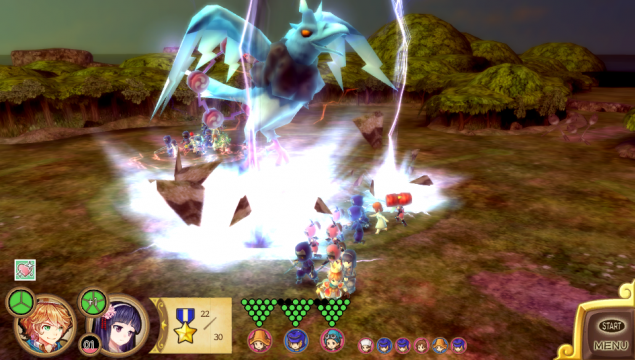 The game took the strategic gameplay of Nintendo’s Pikmin series and took it a step further. You played as a king with the uncanny ability to control the townsfolk, otherwise known as…you know…being a normal king. However, the imprecise controls for a system with a very precise control method left something to be desired. So it’s a good thing that the game feels right at home on the Vita. Bow down, peasants. New Little King’s Story has arrived. As with the last game, players take on the role of King Corobo, a young monarch who’s just been expelled from his castle by demons when the game begins. After escaping a dungeon full of smaller demons, all the king’s horses and all the king’s men decide they can’t just sit by and let the Demon King keep the castle. The group escape to a nearby village and set up a makeshift “castle” in a small cottage. King Corobo still has the power to have the loyal subjects follow his commands, and uses this ability to the fullest advantage. It’s quickly learned that several princesses, which happened to be at the castle when it was attacked, have been imprisoned inside pillars of light, and each are guarded by the Demon King’s lieutenants. Before you can take back your castle, you’ll need to save these princesses. It’s been unclear to most people as to whether this is a sequel or a remake of the original game. It’s not really either. The story isn’t continued from the first game, but it’s not the exact one either. It’s really just an entirely new adventure carrying the same gameplay mechanics and characters. So both newcomers and fans should feel welcome here. The game itself, as mentioned earlier, plays much like Pikmin. As king, it’s your job to recruit the townsfolk into your Royal Guard. These guards will follow you to the ends of the Earth, and charge head-first into whatever it is you point them at. However, peasants are only so useful when they’re considered “carefree,” which is just a fancy word for “unemployed” or “lazy.” It’s up to you to put these folks to work. 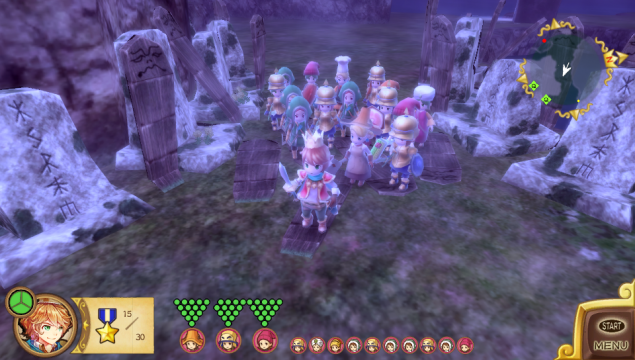 The game can be split into three main aspects: exploration, combat and development. Exploration easily provides the physically largest aspect of the game. 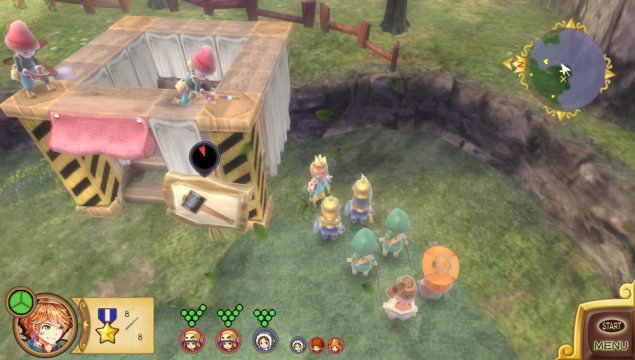 Through the story events and through quests dropped into a suggestion box in the town square, you’re given an objective. It’s usually something as simple as going to a specific point and vanquishing specific enemies. However, there’s much in the world to see and many different paths to take. While you could simply zip right to the waypoint on your mini-map, you’ll be tempted by forks in the road and seeing treasures on cliffs and mysterious other things that dot the overworld. The key to getting anything done while exploring lies in the jobs that you’ve given to the previously carefree adults. Through the building of certain places (which we’ll get into when we talk about development,) the previously lazy townsfolk can become farmers, soldiers, carpenters, miners, lumberjacks, etc. Each job carries with it a specific talent, as well as weaknesses, that are crucial to getting the most out of your treks. For example, farmers can dig into holes in the ground and usually find treasure or healing hot springs. Lumberjacks get massive tree stumps out of the way from moving forward. Guards have increased attack power and are great for breaking down objects. Carpenters build bridges and stairs to get to previously unreachable places. You get the idea. You can only bring with you so many people, so it’s very important to plan your Royal Guard carefully, although you can upgrade the number of people following you as you progress. I’m quite addicted to the exploration aspect of the game. There’s been more than a few times where I was supposed to be going somewhere for a specific reason only to be distracted by a different path that looked like it would yield rewards. Thanks to the day-night cycle in the game, I’ve probably exhausted my own guard for spending endless days and nights wandering around smashing things, digging holes, etc. Along with the many obstacles that you’ll encounter on your journey, you’ll also come into contact with endless amounts of enemies. The different enemies all follow the unusual but special charm that the rest of the game carries. One moment you’ll be fighting some kind of generic demon, the next you’ll be charging into a secret group of giant chickens that meets every night. I’ll never look at a watermelon the same way again, because most of them in the game have tried to eat me so far. Combat is pretty simple, however. You aim your group at whatever it is you want them to charge at and they charge. Sometimes they’ll manage to mount the enemy for more prolonged damage. Sometimes even the carpenters and farmers will get in on the action. There’s nothing really deep about the combat other than the strategic sending and retreating of units when you know an enemy or boss is about to attack. 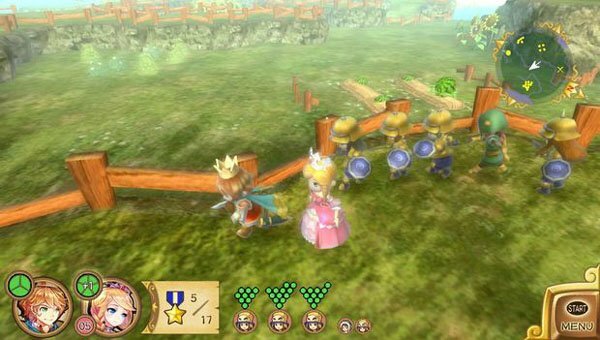 Although abilities unlocked later on will allow you greater commands over your guard, such as getting into a formation surrounding the king as to prevent any unwelcome harm. Any guards that fall are transported to the hospital in town. They’ll be out of action for a few days, but you can use them once again after their wounds have healed. Both King Corobo and your units level up with experience, which is gained by defeating enemies. A fairly textbook way of mixing RPG elements into what’s primarily a strategy game. I wish there were more options with units as far as either cosmetic customization or through upgrades to the units. You can get units that are better than certain ones later on in the game, like the Mega Carpenter to the regular one, but this makes your guard feel like you’re not really able to make your followers your own. This isn’t game-breaking, mind you, but it would have been nice to have the option of a cookie-cutter unit or a specialized one. It’s also worth noting that the game utilizes the touchscreen and rear touchpad on the Vita in order to select units and command them. Much better than just carelessly hoping you’re aiming in the right direction when you hit the “charge” button. After each boss battle with a major demon, there’s a small celebration in the town in which all your townsfolk dance and have a happy time. It’s not time to celebrate yet, however, as you need to start planning your next move. That’s where the final gameplay aspect comes in: development. A throne is an important part of a king’s life and the same could be said of your throne in the game. Sit upon it, and you’ll be presented with several options in order to make your small kingdom into something much greater. Aside from the typical save/load options, you’ll have all the treasure you collected in the field appraised and added to your royal reserves. It’s really fun early on in the game to walk into your castle with only a few thousand of whatever monetary form the game has, and leave your throne with several million after all your treasures are appraised. The money you earn is used for two things: training the carefree adults into jobs and building up your town. You’ll have several options for how you spend your money to better the village ahead of you. The buildings that teach jobs are there, but houses and other important landmarks for the townsfolk are important as well. Each boss and sub-boss means more land claimed in your honor, and more land to develop and build on. You don’t have much of an option of what to build where; everything is pre-determined on where it’ll go, you’re simply paying to have it actually built. Again, would have liked customization options, but I won’t complain with what I’m given here. Landmarks are important as well because they’ll often unlock abilities such as releasing a level cap so your guard can grow more, or increase the number of guards you can have following you at any time. There are also silly things like making it a law that everyone living in your village has to wear swimsuits at all times. Planning your town might be the most important aspect of the entire game. If you spend your money poorly on frivolous buildings, you won’t have any money to train any of the villagers in anything but farming or being a soldier, which are both free. It’s not too much of a set back, as enemies and treasures respawn when you leave an area, but spending your money poorly means you’ll have to grind in order to bring the balance back to everything. It’s really cool to see the town go from just a few houses to a bustling metropolis as you move through the story. If nothing else, the promise of my castle getting bigger and watching the bodies of enemies crumble as I build right over their former habitats is great at driving me forward. I also imagine that’s exactly how Donald Trump feels. The throne is also where you’ll access your suggestion box, where you’ll get silly little fanmail from the people who live in the village as well as quests to embark on and gain rewards or progress the story. You can also download quests from PlayStation Network. While the gameplay is open and addictive, everything I’ve outlined in this review so far is really mostly what there is to it. You’ll follow the cycle of exploration-combat-development over and over again. This wouldn’t be a problem if the game didn’t have a distinct lack of story. The plot I mentioned earlier about a Demon King and trapped princesses couldn’t be more cliche and uninteresting. Sure, there are details a bit further than that, but you likely won’t care due to the fact that they’re largely irrelevant to anything you’re doing. Fans of the original game may or may not like the change in graphical style. Whereas the original game was cute and adorable, the new game is styled more like anime. It works, and it’s beautiful, but purists will wish the original style had remained. As a musician, I’m also extremely disappointed that the soundtrack consists largely of public domain music. It’s really distracting to be a part of a certain story segment and suddenly “Night on Bald Mountain” begins to play. Regardless, I greatly enjoy New Little King’s Story, and recommend it to any Vita owner that’s as starved for games on the handheld as I am. Although the game is repetitive and lacks any real depth, the base gameplay is very easy to get into and provides plenty of stuff to do. Although I’ve written the review already, I’m still playing the game as to clear every single side quest. It’s unfortunate that the game is download-only in North America since I know not everyone has space on a memory card to put the game. But if you have a way, you should find room in your life and on your memory card for a king’s adventure. Especially if you didn’t get the chance to play the original game.